Wilma, hold on to your bloomers! NOT the traditional lemongrass you've been used to. We blended a fabulous tart Lemon with a fresh Grass scent, and there you have one of the most unique fresh clean scents available. Mottled green color. Our 4" Lemon Grass burns for approximately 100 hours. Our 6" Lemon Grass burns for approximately 200 hours. Our 9" Lemon Grass burns for approximately 300 hours. 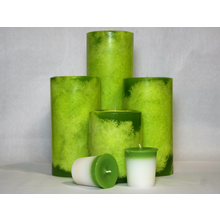 Our Lemon Grass votive burns for approximately 15 hours.